Good memories are a real source of knowledge and understanding. 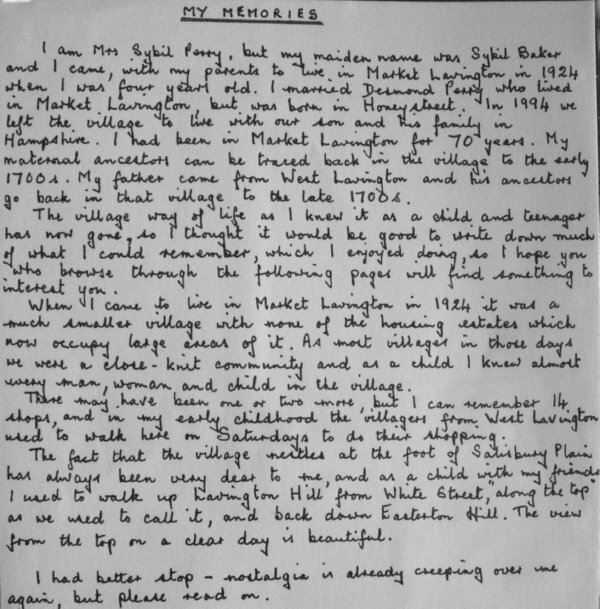 Here we have memories written down by Mrs Elisha in about 1977. Her memories date back and mention of the Central Flying School probably dates that to the time of World War One. Mrs Elisha, or Helena May Potter as she was, was born in 1903 and became the infant teacher at Market Lavington School in the 1920s. Even in 1977 she was still doing bits of supply teaching at the school – by then St Barnabas School on Drove Lane. These memories are about the brickworks and clearly are a response to a request for information which came from Peggy Gye. Here’s an extract and below we have an abbreviated transcript. Mr Merritt, my neighbour in Park Road, tells me you are interested in the history of Lavington Brick and Tile works. I can remember an amount having lived here for 74 years. It was owned by a Thomas Holloway of London, his country home being the Manor House, West Lavington. A good standard of clay was worked from there. The workers were almost on slave labour. The manager was Mr George who lived in the house there with his wife and six children. 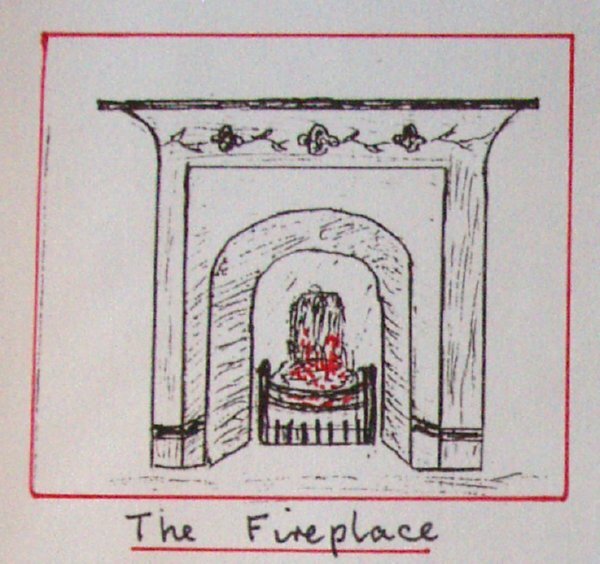 There were also five cottages belonging there which housed workers who were always there to see to the kilns. Mr Grey with wife and son, Mr and Mrs Davidge with 3 boys and 2 girls, Mr and Mrs Plank with 3 boys and 3 girls. These cottages had 2 bedrooms and were in poor condition. Hundreds of bricks were made there – handmade ones too. A big traction engine driven by Mr G Brown of West Lavington hauled 3 big trailer loads. Every other day for a long time the engine hauled its 3 loads of bricks to Upavon which was then called Upavon Central Flying School. The buildings can be plainly seen built with these bricks. Additions have been made. The engine was powerful but often had to do a shuttle service on steep hills returning to the village about 6pm ready to use next day for loading. Fancy flower pots were made there and a few remain in the village. None of the old workers are alive today. G Davidge, 70+, of one of the cottages lives at Spin Hill and Bertha Plank (Baker), 80+ lives at Parsonage Lane. The following comes from an email sent by Tom Gye to our rector in 2010. Tom was looking back over his 90 years in the village and recalling some things he had done. The rector was James Campbell and the memories seem to have been stirred by the name James. When the bells were recast in 1876, a wealthy benefactor had a chiming (carillon) installed. I believe the same person donated the tower clock. 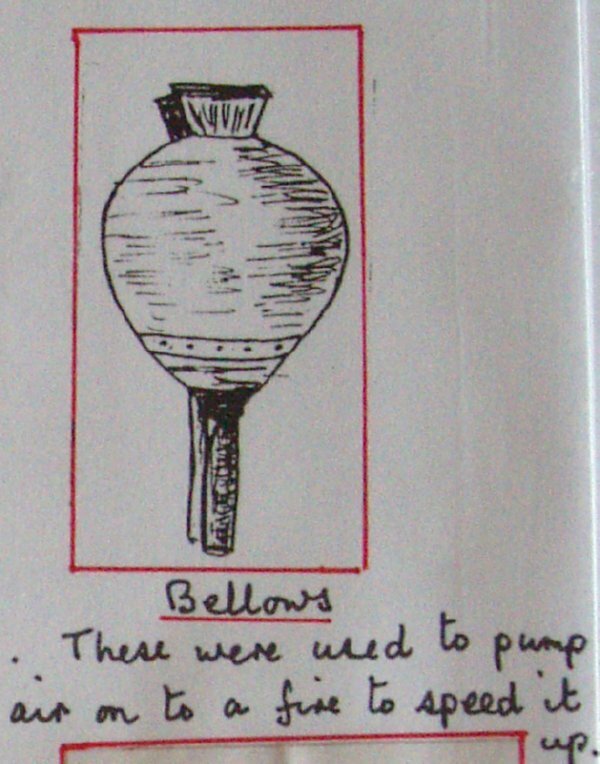 When I started ringing in 1936 the bells were only rung for evensong, the most important service in those days. For matins, the four most senior ringers took it in turns to call the congregation with the carillon. For that the bells had to be fixed to stop them swinging. To enable this, the paid sexton had, every morning, to climb the tower stairs, fly the flag and apply the locking device to the bell wheels. After matins he had to climb the stairs again and unlock the bells ready for evening ringing. The chimers were paid ten shillings annually, which I think came from a charity set up by the carillon donor. I was given the extra name because after my parents had decided T. E. my mother stated that E. would be after her father; to which my father immediately responded, “ If we are having one grandfather we’ll have the other”. The story goes that after an evensong service a group of young men had gathered at the bottom of the Church path surveying the rest of the congregation leaving. When a group of young women approached one of the men said, “Which one be you gonna have James?” James replied “That little dark eyed one.” And in good time he did, and between them they raised nine children to maturity, no mean feat in those days. Their first six children were all girls and the three sons followed. My father was the youngest. Grandfather held the rank of sergeant in the local unit of ‘The Loyal Volunteers’ a forerunner of the Territorial Army. I imagine these voluntary forces date back to the time when Napoleon was a threat before his defeat at Waterloo. The LVs were armed with Martini Henry rifles with bayonet attachments. They had a practice range at the Fiddington end of the village. To obtain extreme range they used to fire across the through road. The targets were marked on iron sheets and positioned in that hollow in the escarpment just south of the Southcliffe Industrial site. I have some silver plated pewter beakers that James won shooting. My wife’s father was also an LV Sergeant and she had some plain pewter beakers her grandfather had won. I used to tease her that mine were silver plated because my grandfather was a better shot. For many years there was a one-eyed man in the village who had been on duty as a ‘marker’ on the firing range. Although there was suitable protection for the markers while the shooting took place, this man did not wait for the shooting to stop and looked round the protection to see the bullet strike on the target. A piece of metal rebounded and hit his eye. Theresa was one of those old village people, kind, gentle, smiling and seemingly content with life. She was born in 1905 in Bromham so her early memories come from there. She married in 1926 and became a Lavington lady. She died in 1994. This piece she wrote appeared in a Womens’ Institute production called ‘Within Living Memory. It dates from 1993. In the Village of Bromham where I lived, when a couple were married and a baby didn’t arrive until nine months had passed, the vicar’s wife would present the couple with a hand-made christening gown. I still have the one given to my parents, and it must be one hundred years old now. My family consisted of five brothers and one sister, plus an orphan boy cousin. Just imagine wash day, all the water had to be drawn from a well shared by three houses – think of the shirts, pinafores, petticoats, bed linen, starched tablecloths – all washed by hand, and my mother didn’t have a mangle for years. On ironing day, my father would make up a huge fire and the irons would be heated in the bars kept in place by the poker. The women used to help with potato planting and picking and also pea picking, otherwise they had enough to do looking after their large families. We always went to Sunday School and no one would have been allowed in a place of worship without the head being covered. During the, summer holiday several families would get together and walk to the top of Roundway Hill, Devizes, about two miles away and spend a day there. The children took tin trays with them, and we used to sit on them and whizz down the hill. There was a dew pond built by Smiths of Market Lavington, which we all paddled in. Once my grandmother decided to have a go. Unfortunately she slipped and sat down in the water. We helped her up and she calmly took off her wet knickers and hung them on a bush to dry, much to the amusement of all us children. Late afternoon we lit a bonfire and fetched some water from a barn at the bottom of the hill and boiled the kettle for tea. Afterwards we cleared up all the rubbish and wend our way home, tired but very happy. Such happy days. In my childhood days, the roads weren’t like they are today. I can remember heaps of large stones by the side of the road and a man with a long handled hammer and dark glasses to protect his eyes cracking the stones. That was quite a common sight. In the holidays my father would drive us to market in a pony and trap, and near the bottom of Dunkirk Hill is a farm called ‘The Ox House’ and in those days (89 years ago) there was a large figure of an ox over the front porch and my father told us that every time the ox heard the clock strike twelve, it would come down and go in to dinner. We used to beg our father to be passing at twelve, but, of course, he never would. I wonder what happened to the ox, but it’s still called Ox House Farm. Market Day was quite different to what it is today. The market place would be filled with rows of cages containing rabbits, ferrets, ducks, hens, cockerels and there were pens for animals, all to be sold by two auctioneers shouting against each other. 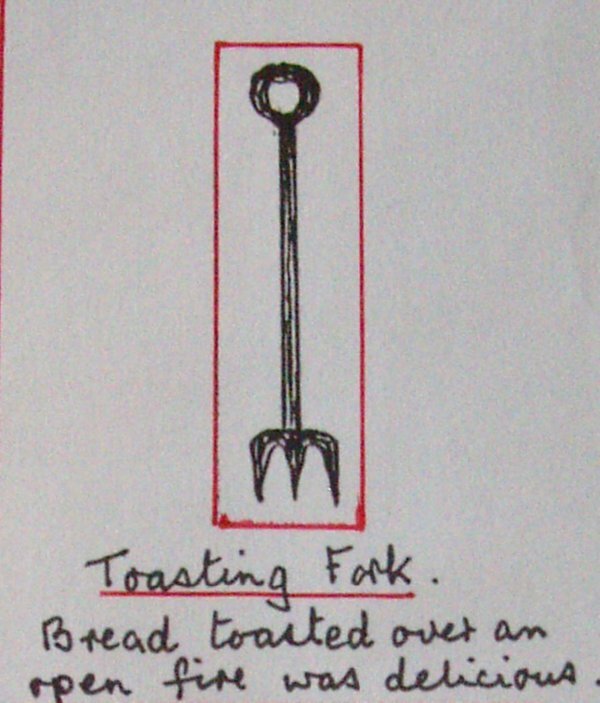 If we were lucky we were treated to faggots and potatoes (no frozen peas in those days!) at a little shop in Northgate Street owned by Wordleys, I’ve never tasted faggots so good as they were. Saturday nights we always had a bath in front of the fire. It was lovely being dried in the warm. My sister and I had a lot of hair, which was washed every week and every day my mother would go through it with a small tooth comb, because nearly all the girls had lice, but we never did due to my mother’s care. In my young days the girls had wooden hoops and the boys iron ones, and we used to trundle them miles. We played hopscotch, marbles, whip-tops and tag. In the evenings my father taught us all sorts of card games and then we had ludo and draughts to amuse us. I can remember the Coronation of King George and Queen Mary in 1911. I still have my husband’s and my coronation cups. In my village we had a big get together in a field. The band played, there were all sorts of things on and we all had free tea. What I can remember most is a chip van outside the field and we were all treated to a pennyworth of chips done up in newspaper. You see my mother never cooked any chips, so they were a treat. In my teenage years I went to dances and in the beginning it was the quadrilles and polka, and then we moved to the valeta, waltz, foxtrot and lancers. I loved being swung off my feet in the lancers, it’s so different today. If we went to Devizes to a dance we all had cards and the young men would write their names down for the dance they wanted. The girls all wore long dresses. Another great day in our lives was the killing of a pig and a butcher would come and joint it for us. My mother made black puddings and we cleaned the henge and plaited it up and it was called chitterlings. I would like to taste some now, “we’ had’ the liver and we melted down the flecks for lard which we used on toast .Then my father would salt the whole side of bacon which hung on the pantry wall and keep us going all the Winter. brothers used to bring their mates home to wash in our bath – didn’t they have fun -all my life I’ve had lot of menfolk friends. My father was a small holder, but he also cut men’s hair on a Saturday evening for 4d. Three of my brothers went to the First World War, two were wounded, but they all came back. One family in the village lost three sons. I can remember the papers at that time -each day the front page was covered with columns of soldiers killed. Every year a ‘hospital week’ was held in aid of Devizes Hospital. It culminated with a procession led through the village by the village band, and we ended up dancing in the field. My father had a lovely voice and every year he joined a group and they went carol singing and one year I went with them. On the Christmas morning we met in the village and sang “Christians Awake, Salute the Happy Morn”. Whether we were appreciated or not I don’t know, as it was only six o’clock! Before the army took over Salisbury Plain, there were lots of farms up there and every Saturday night the farmers and their families came down to the village, as the shops stayed open until 10 o’clock. The men went to the pub and the women did their shopping, caught up with the village news and visited their friends. The children that lived on the hill were let out of school early during the winter, so that they could get home before dark. One day they were caught in a snowstorm and lost their way. Eventually, they were found huddled together under a hayrick. When I was married in 1926 lots of people in this village had to fetch their water from a stream that is still running now. I can see them now with a yoke across their shoulder with two buckets. Then there was the nightsoil business. Lots of it had to be carried through the houses to the street. It was done at night. As for toilet rolls, they haven’t been about that long, we used to cut up squares of newspaper and hang them in the toilet. Then there were lamps to fill and the glasses to clean, a candle to go to bed – and get up in the morning and light a fire to boil the kettle and to get some warmth. What a blessing when we could buy a primus. I’d been married four years and just had my first baby when Market Lavington W.I. was formed – it was 1930. I’m the only founder member still alive. We always started the meeting by singing ‘Jerusalem” but we don’t now. We were pleased with our Institute because we lived six miles from the nearest town, the men could go to pub, but not us women. When we had a speaker from away, we had to put her up for the night as there was no transport to get her home. There were hardly any cars then. We used to have a lovely Christmas party and we could each invite one person, and everybody wanted to come. Every year the butcher, who was a middle-aged man, would have the polka with me, and when it was over he’d book me up for the next year. In the beginning we had a very good choir, which won at several festivals, and also a folk dancing team. Now we play whist, scrabble and skittles. And then when the wireless came it altered our lives. We had a little crystal set and my husband had one earpiece and I had the other, and we listened to the Savoy Orpheans. I really must stop now, but I could go on and on – but would anyone be really interested! And the answer to that last question is, of course, ‘yes, we would’. 1979 is 35 years ago but to many older folk it will feel like yesterday. But much has happened in the field of communications in that time and this extract from Easterton Echoes – the fiftieth one released, makes that point. Back in 1979 the news sheet, delivered to all households in Easterton, was produced on a typewriter and they often had individual quirks – either of the machine or maybe the user. This one, very definitely, delivers a rather pale letter ‘g’. This extract was sent by a former Easterton resident living in the USA. Back in 1979, he’d have written it (maybe typed it) and sent it in a letter to the intended recipient. The letter almost certainly crossed the Atlantic in an aeroplane for by 1979 the days of the ocean liners had all but ended. Even so, it would have taken several days to get the letter to its destination. Nowadays, the sender of this letter will be able to see this post the moment it is published and, if he does see it and chooses to, he could send an instant response. So it is a very different world. And here is what was written back then. There was a time, not so long ago, when a young man walked daily over the hills above Easterton. 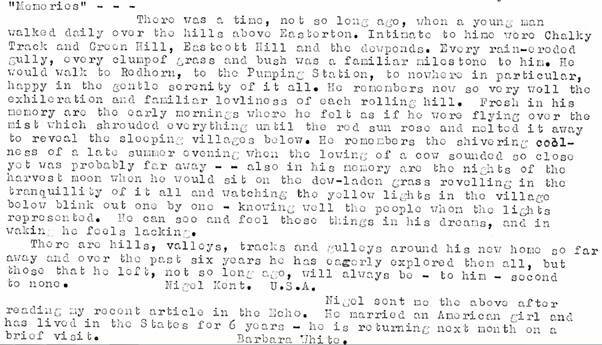 Intimate to him were Chalky Track and Green Hill, Eastcott Hill and the dewponds. Every rain eroded valley, every clump of grass and bush was a familiar milestone to him. He would walk to Redhorn, to the Pumping Station, to nowhere in particular, happy in the gentle serenity of it all. He remembers now so very well the exhilaration and familiar loveliness of each rolling hill, fresh in his mist which shrouded everything until the red sun rose and melted it away to reveal the sleeping village below. He remembers the shivering coolness of a late summer evening when the lowing of a cow sounded so close yet was probably far away. Also in his memory are the nights of the harvest moon when he would sit on the dew laden grass revelling in the tranquillity of it all and watching the yellow lights in the village below blink out one by one – knowing well the people whom the lights represented. He can see and feel these things in his dreams and in waking he feels lacking. There are hills, valleys, tracks and gulleys around his new home so far away and over the past six years he has eagerly explored them all. But those that he left, not so long ago, will always be – to him – second to none. We gather Nigel was about to make a brief return visit. He may be disappointed now, to find that most of Salisbury Plain has been closed to the public. The Pumping Station, for example, is now off limits within the military range. But much of Nigel’s world from forty years ago still remains. In 1892 a new church opened in Market Lavington. This was the new building for the Congregational Church, allowing it to move out of the old Quaker Meeting House. We showed a picture of bricks being delivered to build the chapel in a piece on Fowell Traction Engines. Click here. The centenary was celebrated in 1992 with a number of events. A local free church magazine, ‘Link’, ran some articles of memories by church members. Today we look at the memories of Mrs Hobbs. In 1992 she was the oldest member of the church. She was born in 1902, so her memories date from before 1910. My earliest memories, 87 years ago as a little girl are – going to chapel, sitting between my mother and father (Mr and Mrs George Pike) – the choir and organ were then at the back – standing on the seat turning round and looking at the ladies in the choir. Especially Mrs David Draper who opened her mouth well when singing! MRS Draper was the grandmother of Mrs Ada Askey who was our organist for a good number of years. The Minister I remember was the Rev. Fred Lowe who still lived in his own house just opposite the church when he retired. My dad, every Sunday morning helped him across to the morning service. I can remember him walking round with his walking stick, which he left to dad and I still have it and make use of it myself. This was well over 80 years ago when it was the Congregational Church. As the years went by we had a wonderful Sunday school. All our social life revolved around the church – the Prize Givings, Christmas tree then lit by candles, our Sunday School anniversaries with seats having to be put up the aisles, practising for Sunday School concerts and Social evenings held in the Sunday school (the old chapel). The outings to Edington Tea Gardens or Bratton, Dad getting the wagon and horses from the local farmers then having the wooden boards nailed on each side for seats, very bumpy but we enjoyed our day out. The Sunday School has been a vital part of the Church going back a good many years. The superintendent was Mr James Hobbs of Easterton (no relation) a devoted leader. Several of us little girls used to go part way to Easterton to meet him. Our next leader was Mr Samuel Hopkins (we always called him Uncle Sam) who lived for his church, the choir and Sunday School. Then Mr George Pike (my dad) carried on. He had a class of bigger boys. Some young men called their seats ‘The Lions’ Den’. He was church secretary for many years and a local preacher. Thinking back over the years has brought back many happy memories of the Sunday school, Choir and Chapel. Twenty years on we often get Mrs Hobbs’s daughter to help identify people in museum photos. Having introduced Sybil Perry’s memories yesterday, today we are going to look at her early memories of her Granny Smith’s sitting room. When Sybil and her parents returned to Market Lavington in 1924, it was this house they lived in – Broadwell House on White Street. Here are some memories of that sitting room, nearly ninety years ago. 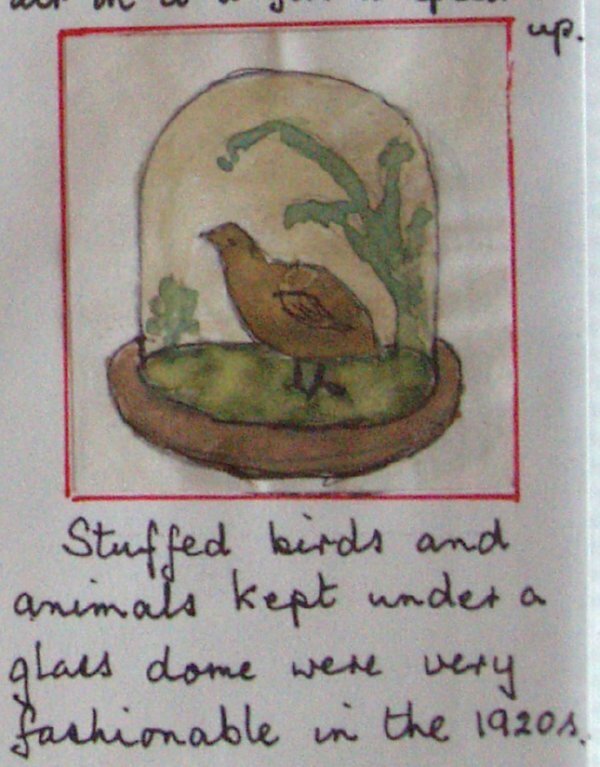 Amongst the many delights of Sybil’s memories are the sketches she has drawn. What fantastic memories they make, not only for Market Lavington. They are genuine pictures of life in the 1920s. One of the real treasures we have at Market Lavington Museum is a folder containing Sybil Perry’s memories. 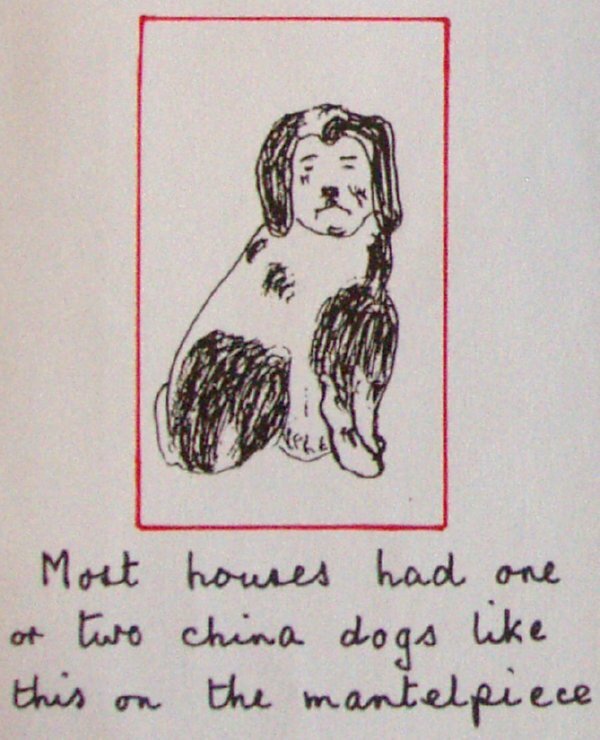 Actually, it is two treasures, for Sybil produced two slightly different versions. Sybil Perry moved to Market Lavington in 1924, with her parents, Mr and Mrs Baker, at the age of four. Her family had lived in the village for generations. Her grandfather had been one of the Smith family, who lived on White Street in Market Lavington. They were renowned as the dew pond diggers. In fact, Sybil’s first home in Market Lavington was her Granny Smith’s house – Broadwell House on White Street. Sybil lived in Market Lavington until 1994 at which point she and her husband, Des Perry, moved away to be nearer children. During her working life Sybil was, like her mother, a school teacher at Market Lavington School. She has featured many times already in this blog. Let’s look at the start of Sybil’s book. And now her signing off – in the year 2006. Sybil died in 2010. Through her memories she remains a true servant of this village. Annie Merritt – but where? 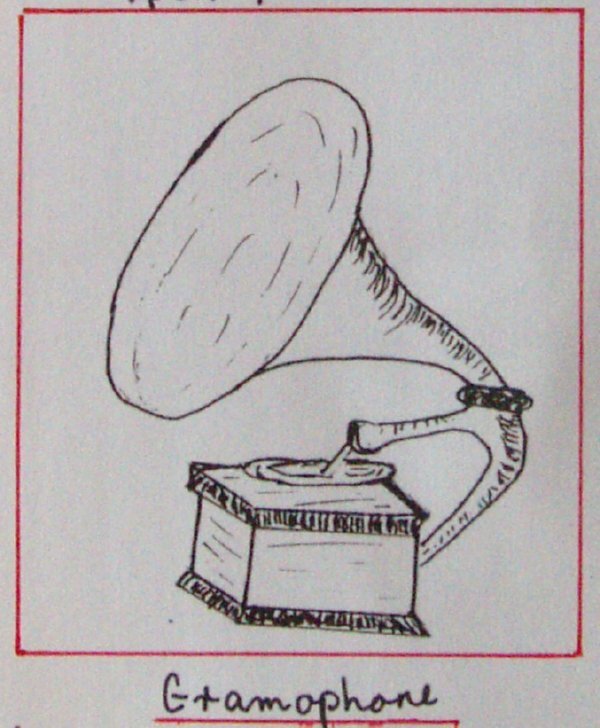 All text, images or other media on this blog is copyrighted to Market Lavington Museum. Please do not use this material without first seeking permission from the curator. More on the location of Maggot’s Castle.